Travel by intercity bus is growing at an extraordinary pace: reflecting a rise in travel demand, escalating fuel prices, and investments in new routes. This confluence of factors has propelled scheduled bus service between cities to its highest level in years and has made the intercity bus the country’s fastest growing mode of transportation for the third year in the row. “Curbside operators,” including BoltBus, DC2NY Bus, and Megabus.com, which eschew traditional stations in favor of curbside pickup and provide customers access to WiFi and other amenities, have enjoyed particular success. The comeback of the intercity bus is noteworthy for the fact that it is taking place without government subsidies or as a result of efforts by planning agencies to promote energy efficient forms of transportation. Instead, it is a market-driven phenomenon that is gradually winning back demographic groups that would have scarcely contemplated setting foot on an intercity bus only a few years ago. Our DePaul University study estimates that curbside operators like Megabus expanded the number of daily departures by 23.9% last year. In the Northeast and Mid-Atlantic states, service grew at an even faster rate. As recently as a decade ago, traditional bus services were all but written off as a “mode of last resort.” A painful and unrelenting decline had pushed intercity buses into the margins of travel. The opening interstate highways, increased automobile ownership, and the deterioration of downtown business districts in major cities had weakened demand for intercity bus services starting in the 1960s. Continued retrenchment took place throughout the 1980s and 1990s—a downturn that pushed Greyhound into bankruptcy and continued even after the terrorist acts of September 11, 2001, which dramatically affected the demand for air travel. By 2006, the sector began a recovery. “Curbside” bus companies had begun operating express service on relatively short-distance corridors linking major cities. Attracting publicity for their steeply discounted fares—with a few seats sold for only $1—these operators sometimes entered service on routes already served by so-called “Chinatown Operators,” bus lines, typically operated by Asian businesses, between the Chinatown districts of major cities. In other instances, curbside carriers infused new life into markets that hadn’t had seen new service in many years, including many routes through the Midwest’s Rust Belt. The largest and best-known of the curbside operators, Megabus.com (“Megabus”), a subsidiary of Coach USA (owned by Stagecoach, Ltd., a British company) opened its Chicago hub in early 2006. In 2008, DC2NY Bus began service between New York City and Washington, D.C., differentiating its product with wireless internet service and other amenities. Megabus and BoltBus (a joint venture between Greyhound and Peter Pan Lines) soon followed suit and took the model one step further by building full-scale hubs based out of Manhattan. On the West Coast, California Shuttle launched service between the San Francisco Bay Area and Los Angeles, albeit with limited schedule frequency. All this early success made the brisk expansion of 2010—a time of economic difficulty for American transportation—all the more remarkable. Curbside operators such as Boltbus and Megabus expanded their number of departures by 23.9%, accounting for more than 440 daily bus operations in the continental United States. A significant share of the growth—68 daily departures—took place to and from Megabus’ new Philadelphia and Washington, D.C. hubs, both launched in the latter half of 2010. 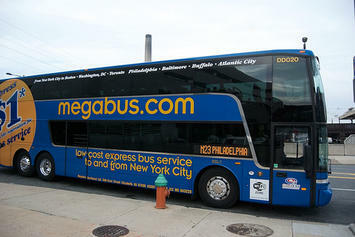 For the first time, with the advent of its Philadelphia hub, Megabus operated a route that did not originate nor terminate in Chicago, Los Angeles, or New York. This change marks an important shift in expansion strategies of curbside operators into somewhat smaller origin-destination combinations. This trend continued with hubs created in Washington, D.C., resulting in new express service provided from the nation’s capital to eight cities, including Boston, Mass., Knoxville, Tenn., Raleigh, N.C., and Richmond, Va., with a new hub in Pittsburgh, Penn. announced earlier this month. Only a few years ago, the idea of a private company publicizing new express bus service linking shrinking industrial cities like Pittsburgh to Detroit would have seemed unlikely, but it is happening today. For the third year in a row, the intercity bus service was the fastest growing mode of intercity transportation, outpacing air and rail transportation. The amount of bus service—the total number of daily departures, inclusive of both curbside and traditional carriers like Greyhound and Trailways—grew by 6.01%. The number of airline departures rose by about 3% in 2010 while the number of train miles operated by Amtrak rose by a modest 0.5%. Greyhound, now twenty years out of bankruptcy, is also showing signs of life. Last December, the carrier introduced premium service on selected routes from Chicago offering passengers receive free WiFi internet, more spacious cabins, and guaranteed seating. A year earlier Greyhound unveiled a similar product upgrade on certain East Coast routes that included new buses and an advertising campaign aimed at diversifying its ridership. In the Southeast, a new luxury operator, Red Coach, launched last between South Florida and Central Florida as well as points as far north as Atlanta. Red Coach offers extra-wide seats that decline to near-horizontal positions as well as a GPS satellite monitoring system. Curbside buses achieve more than 160 passenger-miles per gallon of fuel burned, making them several times more fuel efficient than commercial airplanes and private automobiles, as well as conventional diesel trains. Using the results of a survey we administered to 250 curbside-bus passengers in East Coast and Midwestern revealing how passengers would have traveled had curbside bus service not been available, we estimate that curbside bus service is reducing fuel consumption by about 11 million gallons annually and reducing carbon emission by an estimated 242 million pounds—the equivalent of removing about 23,818 vehicles from the road. When making these estimates, we take into account the fact that curbside operators, in part due to their low fares, have a stimulating effect. That is, they generate new travel. We measure how some of the potential reduction in fuel consumption is offset by additional trips made by consumers. The growing prevalence of portable electronic technology, such as laptops and cellphones, gives intercity bus a new competitive advantage over air service and driving. At randomly selected points, we estimate in our analysis of traveler use of technology that more than 40% of passengers on curbside buses are equipped with portable devices, a percentage higher than on Amtrak (perhaps due to the free Wi Fi) and much higher than on commercial airplanes. Customers who place a premium on their ability to access electronic devices apparently find curbside bus service a particularly attractive option. By all indications, we will see more intercity bus expansion over the next year. We anticipate that new service will likely emerge over the next several years in places where little or no curbside service is available, such as in California, Florida, and Texas. It appears only a matter of time before curbside operators make a significant presence throughout the United States, something remarkable considering that this mode entered the scene just a few years ago. Joseph Schwieterman, Ph.D., is a professor at DePaul University in Chicago and director of the school’s Chaddick Institute for Metropolitan Development. Submitted by moonkahn on Tue, 05/05/2015 - 09:57. Submitted by brookehiggins007 on Tue, 05/05/2015 - 07:33. It is true that people prefer to Travel by intercity bus. This trend is growing at an extraordinary pace. This indicates that cheap and secure services always attracts travelers, that is why luton meet and greet parking is providing cheap services for holidaymaker. Submitted by moonkahn on Sat, 05/02/2015 - 12:04. Submitted by moonkahn on Mon, 03/16/2015 - 02:55. Apple Ibeacon Provides us free online solutions and Mobile apps, Wallets... ETC... It provide services long time.For more information visit the above link. Submitted by syncseo123 on Sat, 12/07/2013 - 08:06. Submitted by Kile Mills on Thu, 10/03/2013 - 02:49. Bus services are the best public transit systems in the City and Metro areas. People in large numbers use public transportation system regularly. Shuttle bus service is also very common and famous in big Cities. City bus service or Intercity is very common and very helpful for their transportation to different places inside or outside the City. Submitted by utkhans on Sat, 08/31/2013 - 04:33. Submitted by Monir on Wed, 05/01/2013 - 06:21. Submitted by orlando9 on Thu, 03/07/2013 - 02:40. Traveling is essential for human being . It gives a great comfort to our mind . But now a days it is not complicated as before . All you need is good information and a perfect planing . Find out more about traveling at best online hotel booking website . Submitted by tommycarter on Sat, 12/08/2012 - 01:21. What about a cebu rent a car if there's no vacant in the bus and for the VIP exclusively?